Over years, research in Management Information Systems (MIS) has resulted in significant implications for organizations in a wide variety of areas by using socio-technical perspective, which has helped to deliver more business focused solutions. This study reports the results of an empirical examination of the effect of IT governance framework based on COBIT and Organizational Knowledge Pillars in enhancing the IT Governance framework (Business / IT Strategic alignment, Business value delivery, risk management, Resource management, performance measurement) to enhance the business intelligence application and usability within the organization. Quantitative method is adopted for answering the research questions. A questionnaire was used for data collection after contacting several companies, in addition confirmatory factor model and structural equation model were developed and tested and the overall results of the empirical investigation supported the general framework. Using confirmatory factor analysis techniques, the effects of the combination between IT governance factors seen by ITGI and organizational knowledge pillars of the firm on BI Systems application in it were tested and confirmed and the models were also verified. Several statistical methods were used for data analysis; moreover different statistical tools as software packages were employed such as SPSS 17 and EQS 6.1. The study proposes that knowledge management (KM) and IT Governance framework are vital organizational abilities that support business intelligence application; it also observes that combination of IT governance framework with organizational knowledge within the firm can enhance the organization’s BI system application and usability, and its goal is to advance the understanding of the relationships among these factors. The study develops and tested two main hypothesizes: (1) IT Governance framework supports business intelligence application. 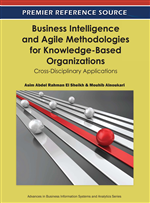 (2) Organizational knowledge, in turn, leads to support business intelligence application. The knowledge-based view (KBV) theory looks at the organization as a combination of several assets and resources and explains how organizations can get added value from these assets and resources (Grant & Chen, 2005). in addition Styhre (2004) claimed that the organization should be viewed as a site of continuous development and integration pool of all resources like physical, financial and human resources, because of that, two of the main intangible assets of the firm (IT capabilities and knowledge capabilities) are not reflected in the financial indicators although the impact of IT in globalization is evident. Furthermore the role of humans was always important, but it is clear that management experiences are nearly poor in developing countries so it’s hard to attain a competitive advantage without the existing of mature management and the know-how experiences (Le Chien Thang et. el., 2007). Following this notion and based on Aristotle's dictum to enhance the utilization of the organization's capabilities, Avison & Fitzgerald (2006) incline that is better to build the widest possible information system for the whole organization rather than building it for particular isolation functions depending, so the integration here is a necessity as indicated by (Haag & Cummings, 2008), in addition Newell, el. al., (2003) confirmed that it is possible to apply business intelligence system in a form of information system and Knowledge Management (KM) systems on the organization which can be simultaneously have a good effect, although this outcome is not automatic, and should be fostered. Information technology/systems need solid vision and robust planning since IT/IS is viewed as the means not as desired end, notably, it should be in line with culture, values and needs of the organization (Commonwealth Telecommunications Organization, 2002), Another important issue is Knowledge Management (KM) as one of the key progress factors in organizations, is that it involves explicit and persistent representation of knowledge of dispersed groups of people in the organization, so as to improve the activities of the organization because knowledge management is an vital issue in human resource management and enterprise organization, and also user engagement in the company project one of the most important benchmarks is the as seen by (Hwang & Thorn, 1999).